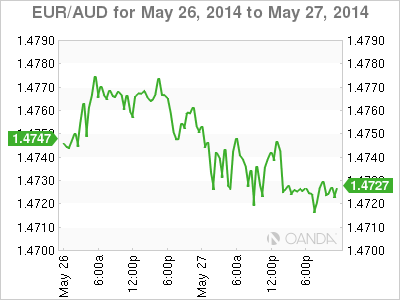 There has been little negative reaction in the EUR to the outcome of the European Union (EU) elections, where support for the anti-EU movement surged. Despite antiausterity’s growth, the status quo prevails. In any event, the better showing for the euro-skeptics was already well priced into the markets and some risks, like renewed political instability in Italy, did not materialize. The mainstream pro-EU political parties continue to dominate, guaranteeing no imminent reversal of “the push toward deeper integration.” If anything, perhaps the rise of the euro-skeptic could be good for the markets – their “new” influence could help streamline European bureaucratic red tape problems. While the eurozone adopts an early risk-on stance after the elections, geopolitics is again in the headlines with further casualties in Ukraine. This will keep some of the short-end EUR product curves better bid. Capital markets tend to have a single-minded focus and its primary concern right now is not with the EU election results. In fact, that can wait for another day, and when it becomes an issue it will have more of a domestic impact than a federal. Just ask the U.K.’s Prime Minister David Cameron what he can expect at next year’s general election with the rise of the U.K. Independence Party, or French President Francois Hollande who will battle with Marine Le Pen’s National Front. With U.K. and U.S. participants just now returning from an extended weekend, market complacency continues, highlighted by low volatility and low yields. 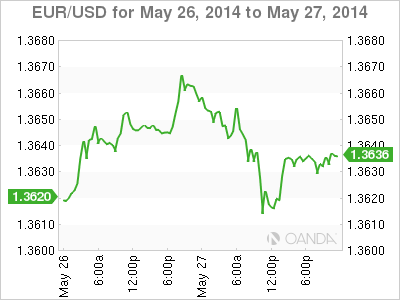 Investors’ primary focus is the potential policy action at the next European Central Bank (ECB) meeting on June 5. So far, the potential of further easing is helping to fuel gains in equities and some weakness in the in the 18-member single currency. The ECB’s Jackson Hole-style symposium in Portugal had a lot to do with discussing strategy ahead of next week’s policy-setting meet. Eurozone policymakers need to come up with ways to stimulate lending to small businesses where credit channels remain blocked. Next week, ECB President Mario Draghi and company are expected to announce “conventional” monetary policy measures (cuts to overnight and deposit rates), peppered with a few “unconventional” measures to stimulate lending. All ECB members are required to speak from the same script; obviously any dissent will favor the EUR and undermine the ECB’s intentions. Euro policymaker’s credibility would be called into question very quickly, and this will allow the market to immediately “run riot” over all eurozone initiatives. 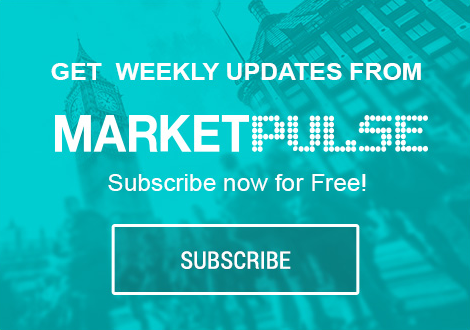 The positive reaction seen in Economic and Monetary Union peripheral stocks and narrow yield spreads after the EU elections seem to be offering the EUR bull a lifeline. However, expect stronger market moves to take place after next week’s ECB announcement, until then, resistance at €1.3670 needs to be cleared out to suggest that the single currency has somewhat bottomed out. Many of the market players favor staying short the single unit, preferring to trail their stop-losses down from €1.3700. 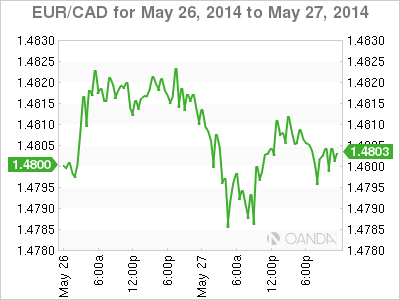 Last Thursday’s high (€1.3688) weighs in the interim, and should stem most short-term corrective moves. Stateside, the U.S. data front gets a bit more important for FX markets as the debate regarding the Federal Reserve’s exit strategies gains momentum. 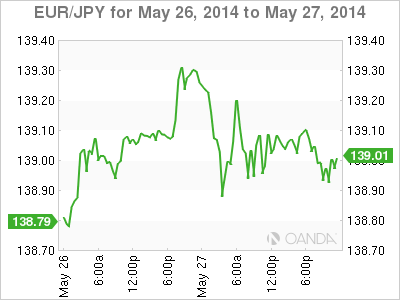 Durable goods and consumer confidence data are set for release in today’s session. However, large EUR expiries (€1B, €1.3620-25, €1.3680,€500M, €1.3700-05) have a nasty habit of containing a market. Decent market bids for the single currency still remain ahead of the psychological and option barrier located at €1.3600. Pushing the ECB aside for one moment – month-end could again be an issue for many. 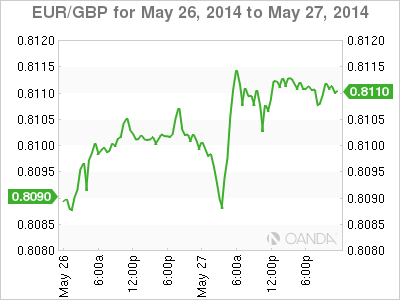 Last month was unusual, with the eurozone money market being very tight, but May is proving to be even tighter. The fixed-income and money market desks note that the euro overnight index average, known as the EONIA rate, averaged +0.425% yesterday, with one week at +0.28% — still above the refi-rate (+0.25%). Liquidity relief will not come until after the ECB delivers and it better otherwise the market will compound volatility until the start of the World Cup in early June. Just before heading stateside, Italian consumer confidence continued to rise this month and is at its highest level since January, 2010 (106.3 versus 104.9). Households remain optimistic about their future. It seems that Italian Prime Minister Matteo Renzi is inspiring the national mood. Renzi has been in power for three months, having swept into office promising reforms to reduce record unemployment and lift the nation’s economy out of recession. Italy was one country that the euro-skeptic movement could have been a problem; however, Renzi’s triumph is good for the markets.